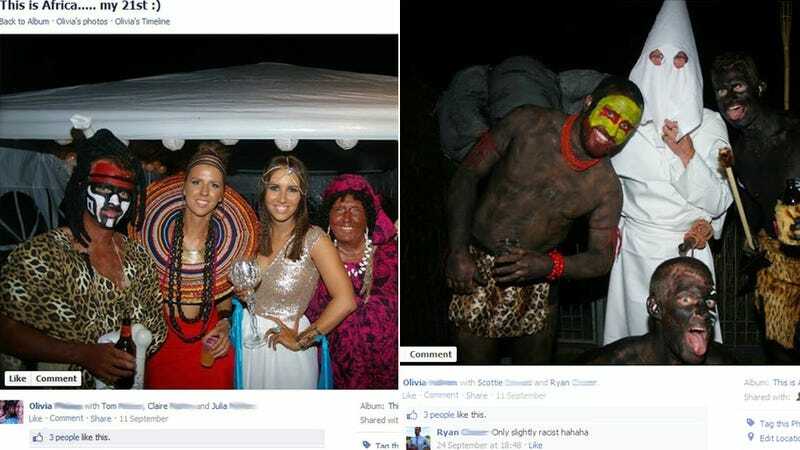 A young white Australian woman turned 21 and decided to have an "African" themed birthday party. After the festivities, she posted photos to Facebook. Ignorance, insensitivity and racism ahoy! Africa is HUGE, a vast continent. Large enough that you could fit the United States, China, India and Eastern Europe inside of it and have space leftover. 1. This is NOT the same as wearing Oktoberfest costumes because that is a specific holiday and country, not an ENTIRE CONTINENT of people, many of whom were routinely enslaved, colonized and oppressed by white people for centuries. 2. AFRICA IS NOT A COUNTRY. 3. You're 21 and you can't spell. For her birthday, this woman is getting a talking-to from the internet. Many happy returns! I hope she actually does get to go travel to some African countries, to be honest. Fighting ignorance with education is the only hope we have.